Red is one of my favourite colours. Lately, more and more shades of red have been creeping into my wardrobe. 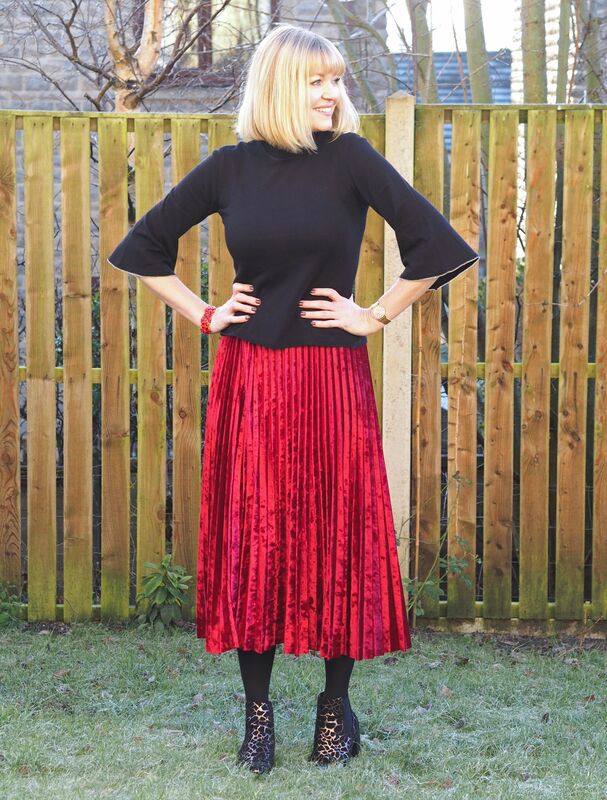 This rich red velvet pleated skirt caught my eye in early autumn. 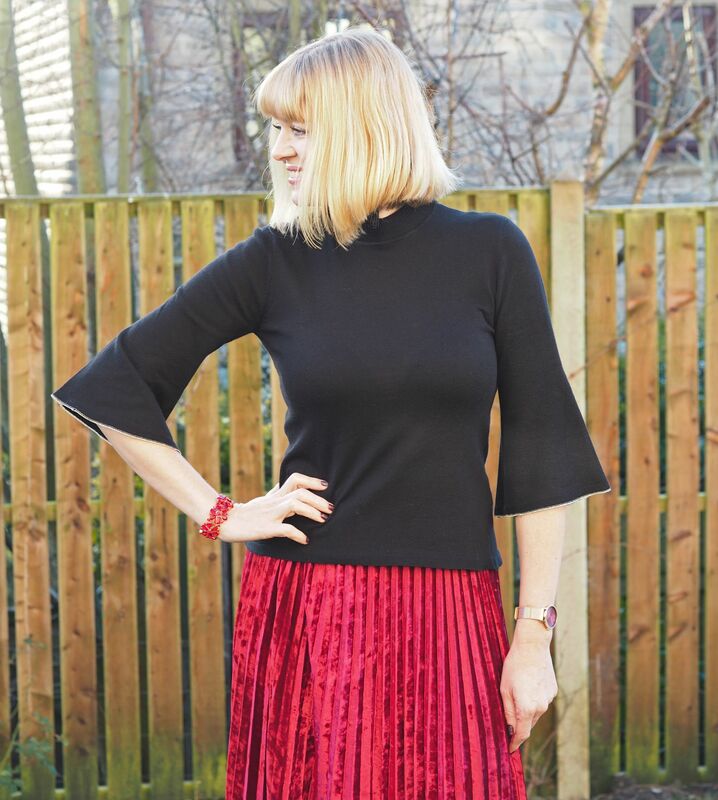 It’s from Marks and Spencer and I knew it would be as popular as the burgundy velvet midi dress in my previous post. I bought it there and then and waited for an appropriately festive occasion to wear it. 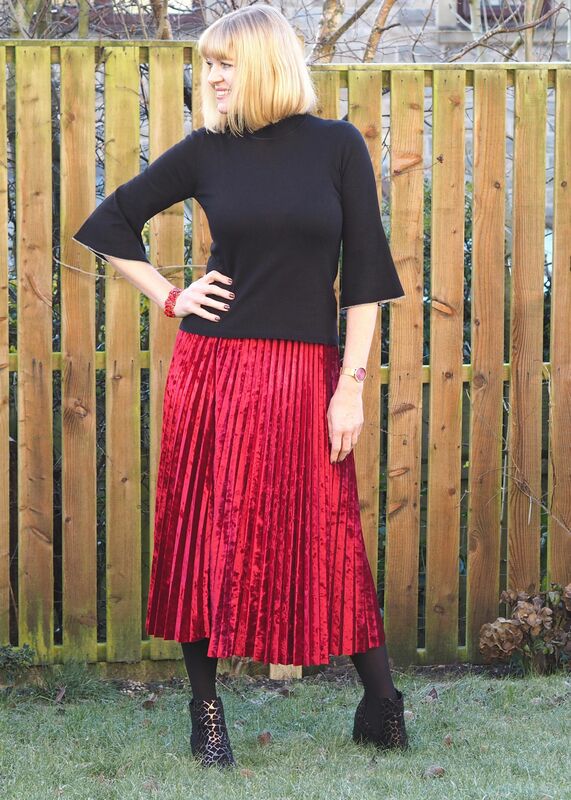 In my opinion, although red is certainly not just for Christmas, the sumptuously tactile velvet in this most divine shade, epitomises the season. I’ve worn it on three separate occasions and each time felt so happy and excited. Of course, that’s because I was with someone special, (Sally, Ian and then Liz, my dear friend of over 20 years,). But, there’s definitely something uplifting about wearing red. 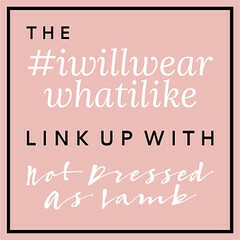 Just like I did with my blush pink velvet midi skirt, I teamed with a top that has sleeve detail for balance. This one is by Biba at House of Fraser. I love the fluted sleeves and the metallic edge. It’s super soft and comfortable and also comes in a glorious shade of yellow, which would look amazing on a gal who is less fair-skinned than I! 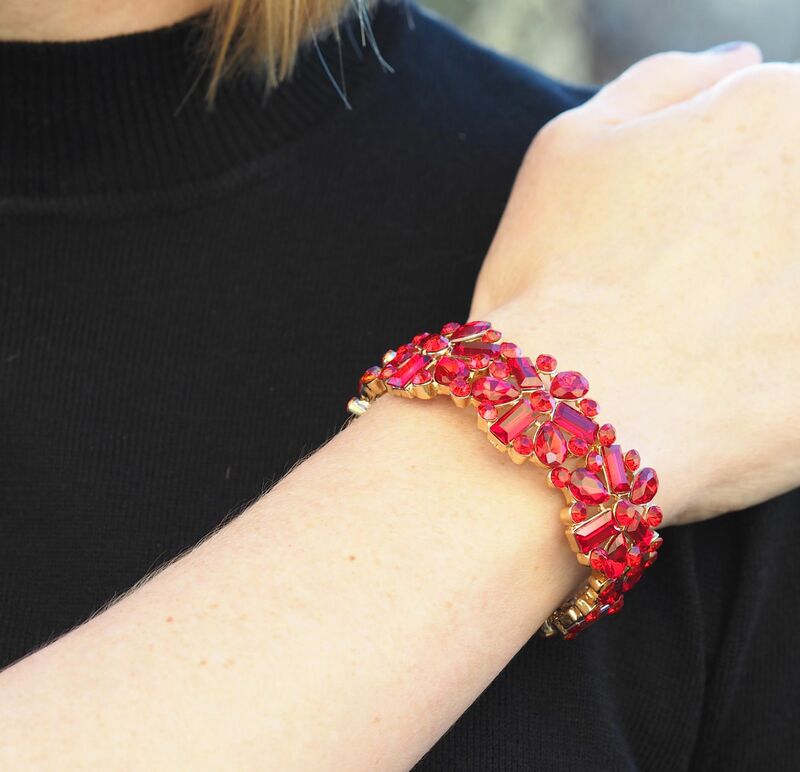 The stunning red glass stretch bracelet is a gift from Olivia Divine. The owner Beverley is a one woman band and she asked if I’d like a few pieces from her website. I choose this bracelet in the red and in navy blue and bright pink too. I know already that I’ll wear the navy one for a black-tie event I’m attending in January. 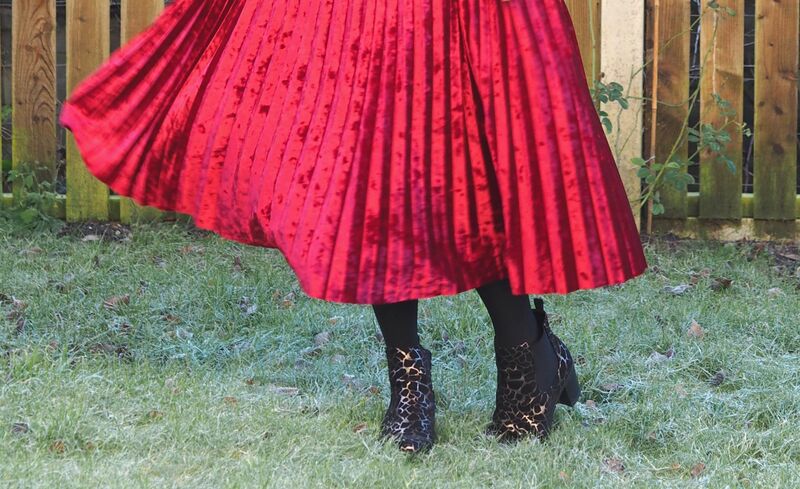 They’re so pretty and eye-catching and this one goes beautifully with my red velvet pleated skirt. 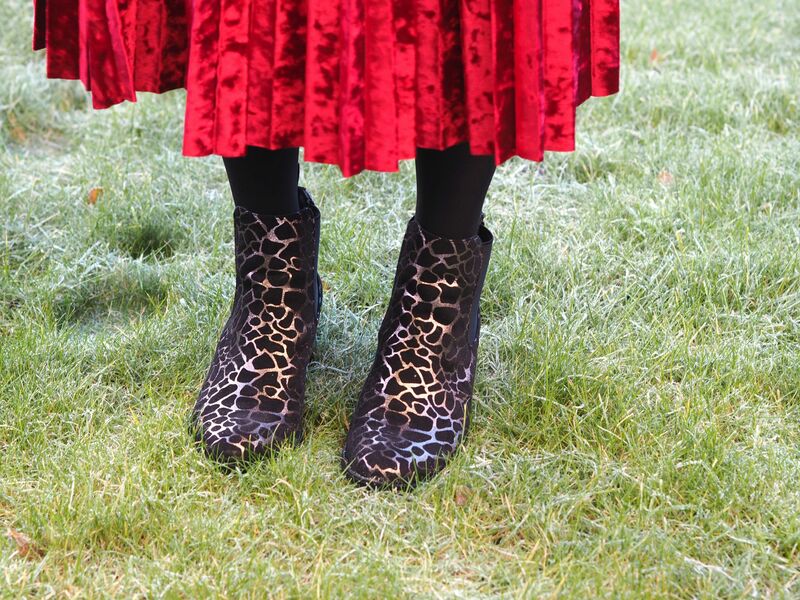 I’ve worn these metallic animal print boots over and over with both trousers and skirts. 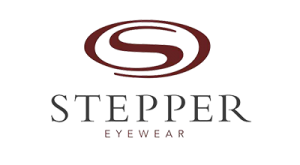 They work with so many outfits and are perfect for both day and evening wear. They’re called the Ennis and are by Lotus. At the time of writing, they’re reduced to £41.99 from £59.99 in House of Fraser. If you prefer a less blingy boot, they’re availabe in black too. Thank you to Olivia Divine for my bracelet and thank YOU for supporting the brands that support What LIzzy Loves. This is my last post before Christmas. I’d like to wish you and your families a very, very Happy Christmas. Thank you so much for reading. 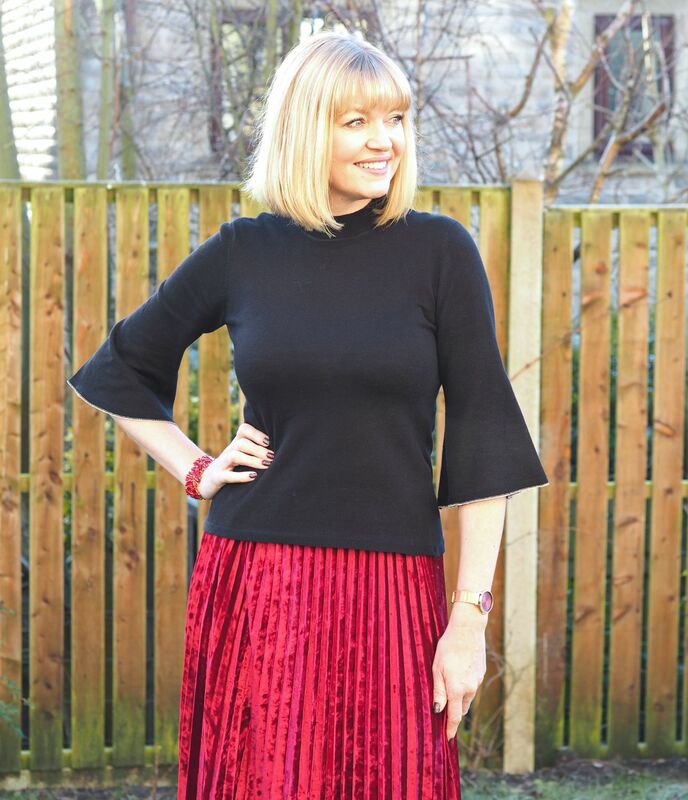 Such a beautiful skirt! You look lovely Lizzy. I hope you have a lovely Christmas. Very elegant and that bracelet is beautiful! Merry Christmas!